I have to admit, that I am NOT a Mise En Place kind of girl. I usually dive into recipes without a care in the world until I realize that I need something that is not sitting in my pantry and have to run out to the store mid-stream. So, on the day of my Girl Scout troop meeting, literally minutes before I had to be at the school picking them up, I realized there was no mention of an egg in the list of ingredients. I panicked a little, but trudged forward and threw the batter together anyway. What else could I do? When telling the girls that we would be baking Raspberry Linzer cookies, I added a disclaimer. “They may not turn out…not sure…really haven’t made cookies without eggs before BUT and here’s the biggest BUT…the dough is safe to eat as-is, raw so feel free to nibble on the dough as we bake.” The cheers could have been heard down the block. This was a pretty big coup as far as my girls were concerned. They were being told they could EAT THE COOKIE DOUGH! This cookie project ended up being a huge success as girls happily cut out and nibbled on dough, chatted away and spread Nutella or Jam on their cookies while being politely asked not to lick their fingers. 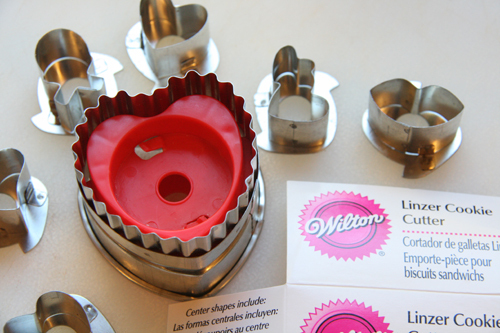 As icing on the cake or perhaps more like powdered sugar on the cookies, they got to use the coolest cookie cutter EVER. Really. It’s from Wilton and I picked it up from our local Michael’s craft store for $4.99. 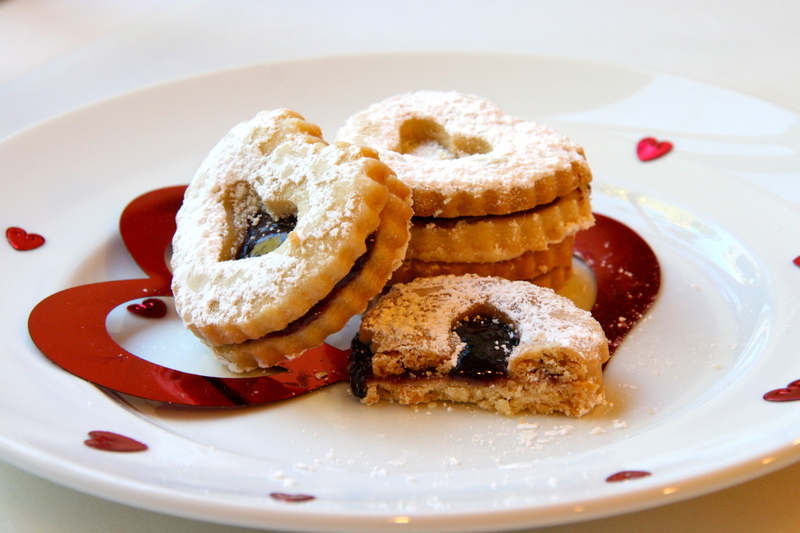 It cuts beautiful mini Linzer cookies AND has a choice of six differently shaped centers to cut out. 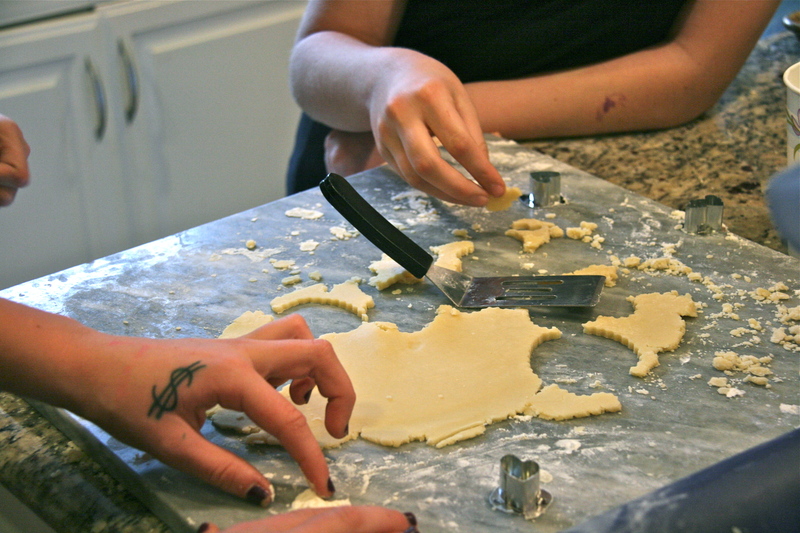 The girls would twist on and off the little centers of the cookie cutters and choose the design of their liking. What fun for kids and adults alike! I hope you get a chance to make this traditional Valentine’s Day cookie because they are oh-so-beautiful and just as delicious—and you have MY permission to nibble on the dough! For the Cookies: Preheat the oven to 350 degrees F.
Bake the cookies for 20 to 25 minutes, until the edges begin to brown. Allow to cool to room temperature. 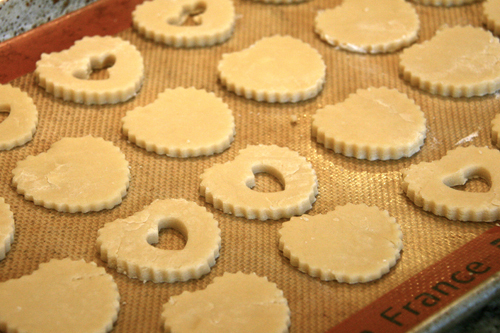 Spread raspberry preserves on the flat side of each solid cookie. Dust the top of the cut-out cookies with confectioners’ sugar and press the flat sides together, with the raspberry preserves in the middle and or Nutella and the confectioners’ sugar on the top. They look delicious, I’ll have to give them a try. Maybe its genetic? 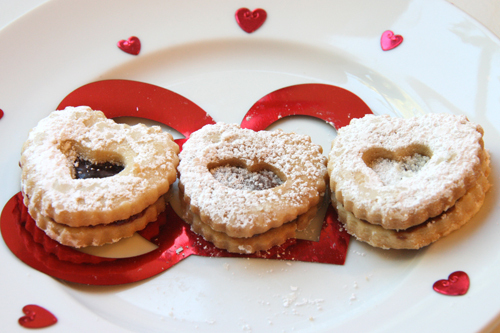 haha I would love to nibble on these linzer cookies too soon they look delicious! Perfect for dough eaters, like me! Looks fabulous – can’t wait to see what is up next! Beautiful cookies! 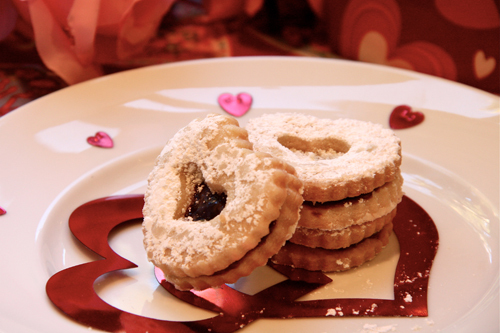 I need to get those linzer cookie cutters so I can make this. So I’ve been itching to try my hand at Linzers for a while now, and it must be in my destiny because both you and Smitten Kitchen have posted about it! I’ve got to roll my sleeves up and get a-workin’! I’m sure the girls had a memorable day…the cookies look terrific.